Some boat builders are responding to these unsettling economic times by launching smaller, more affordable boats, but the folks at Gunboat are charging full steam ahead. Maybe that's because these guys are one of only a few companies that build all carbon cruising cats and the only ones with fully enclosed bridge deck saloons---and crazy speed potential. Sailing north of 20 knots is magical: waves, trees and the shore seem to dissolve at this blistering pace, albeit while the crew typically holds on for dear life. Imagine, though, sailing this fast while sipping chardonnay and enjoying a delicious meal, while an autopilot steers the boat. This was but one of several eye-opening moments I experienced during a weeklong cruise through the Hawaiian Islands on a new Gunboat 66. Besides speed, “custom” is the second most important word in the Gunboat vocabulary. Gunboat doesn’t like to move structural bulkheads, but nearly everything else is fair game. Among the many high-end features found on this world-class cruising yacht, perhaps the most impressive is its composite construction. Practically everything, even the dinghy davits, is built of carbon fiber. The result is a featherweight cruiser with the sail area, beam and power to dominate on a racecourse. Step inside the saloon and the sweeping 360-degree view is the first thing that strikes you. Multiple doors leading to a forward working cockpit or astern to the aft cockpit enhance airflow. Night watches can be spent dry and comfortable as the primary helm station is situated inside, next to the nav station. The boat is best experienced with a strong breeze on the hip, as its chisel-like bows make short work of all seas. Once the anchor is dropped, the GB66 becomes the ultimate party platform, with a spacious covered aft cockpit, dual swimming ladders, wonderfully comfortable nets, and ample privacy for three or four couples. The hulls and deck are vacuum bagged, post-cured in an oven and built of epoxy with foam and Nomex honeycomb core materials. The core is thermo-molded into the correct shape prior to lamination and is then sheathed in carbon fiber. Sacrificial false bows, collision bulkheads in the bow and stern, and several independent watertight bilge areas provide further security in the event of collision. The lay-up involves a “wet-preg” process, in which carbon cloth is run through an epoxy bath and then pulled through high-pressure rollers before being set in place. The deck joint is laminated, vacuum-bagged with SP epoxy and post-cured, so there is no evident flange, creating a monocoque hull and deck structure. Bulkheads and all other structural members are tabbed with epoxy and carbon fiber, then vacuum bagged and post cured as well. 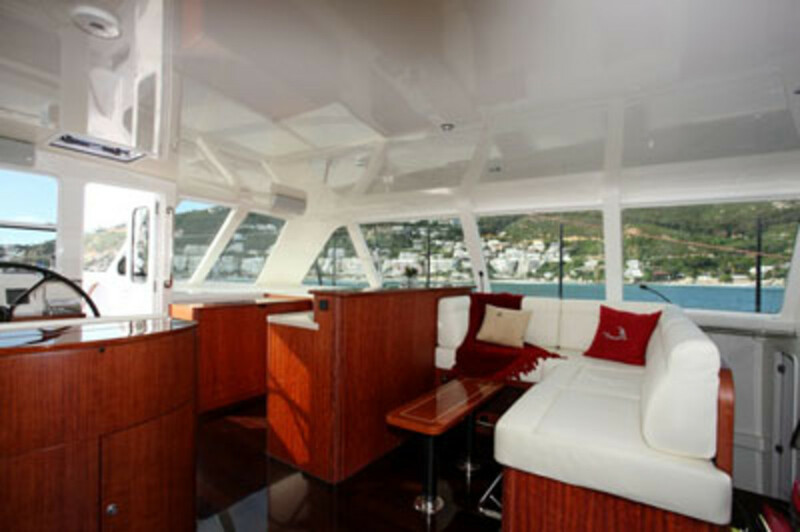 The standard joinery features an African Sapele veneer, while the cabin sole has a Brazilian Mahogany veneer. The Marstrom rig is carbon, and all standing rigging is either carbon or unidirectional Aramid. The daggerboards and cassette-style rudders are also carbon. Like all Gunboats, the deck layout is clean and is configured for efficient sail handling. All headsails, including a Solent, a storm jib, a screecher and an asymmetric spinnaker, are free-flying and furl on their luffs. 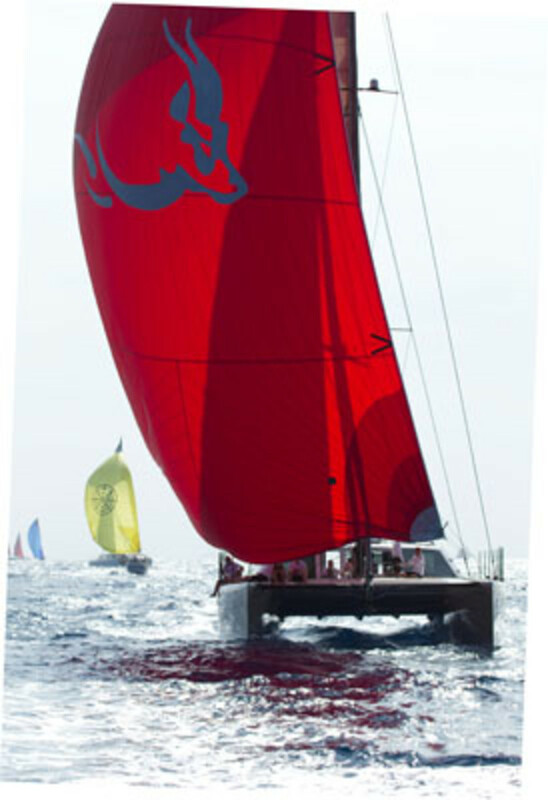 The crew can furl the sails and drop them, sausage-style, or leave them set between the mast and the carbon-fiber Longeron, or sprit. The nets are Spectra, as are the lifelines. The tops of each hull are slightly rounded, allowing for water to drain off the deck quickly and for ergonomic hiking during races. The aft cockpit is fully covered, providing excellent sun, rain and spray protection. 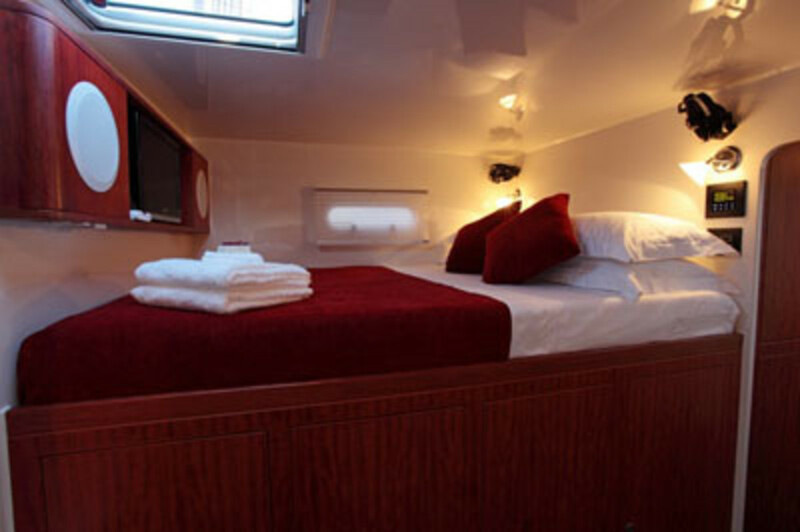 The standard layout calls for four queen-sized cabins, each equipped with an ensuite head and shower. Dedicated crew quarters are equipped with an ensuite head and shower as well. This configuration easily allows four couples and crew to cruise comfortably. Additional berths are available in the saloon if necessary. 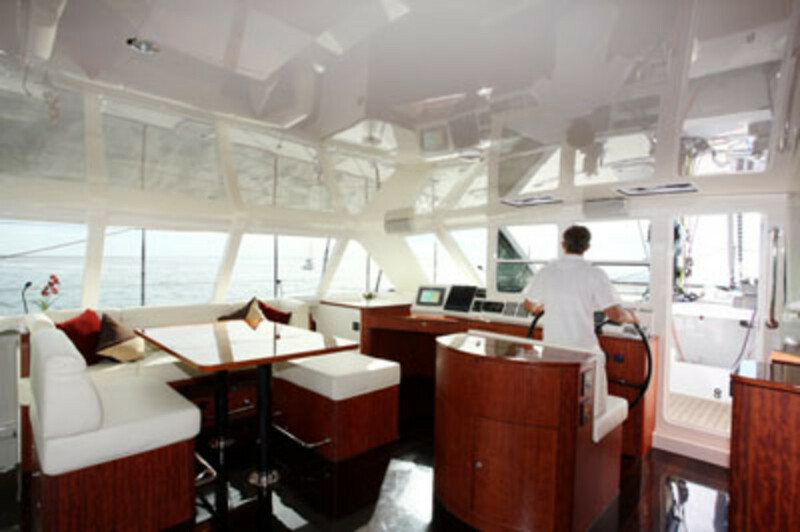 The standard saloon layout features a large settee area with a folding dinette table, a forward-looking nav and helm station, a spacious galley and plenty of lounging room. As with the rest of the accommodation plan, it is also fully customizable. Two aft-facing doors to port and starboard open onto the spacious “back porch” aft cockpit. The boat’s large windows let in ample sunlight, and each cabin is well ventilated through various portholes and hatches. Headroom is generous, handrails and fiddles are where you want them, and there’s plenty of stowage throughout the boat. gen sets, watermakers, entertainment systems and other cruising “necessities.” A walk-in engine room with walk-around clearance facilitates maintenance. Unlike many other big cruising cats that feel more like trawlers than sailboats, the Gunboat 66 is a sailor’s catamaran, offering the kind of performance that will make monohullers envious. In flat water, the boat tacks effortlessly through 95 degrees. Even more impressive is its ability to comfortably sail 300 miles or more in a single day. Like all high-performance multihulls, the Gunboat 66 generates her own apparent breeze, meaning that the entire sail wardrobe is flat-cut. A self-tacking jib track allows for easy upwind sail handling, and a lifting daggerboard in each hull facilitates close-winded performance and good VMG. The twin Volvo Penta D2-55 Hp Diesel sail drives on our test boat tackled everything from negotiating tight marinas to the white squall (40-plus knots of wind and 8-foot waves) that we encountered while motoring from Lanai to Maui. Under power, she easily made 8.5 knots at cruising revolutions in flat water with one engine and 9.5 knots with both screws turning. 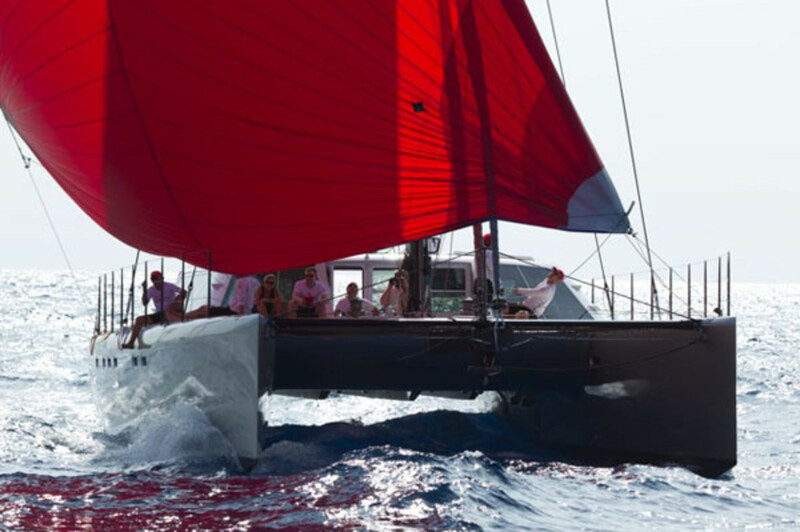 The Gunboat 66 offers the close-winded performance, tight tacking angles and impressive average runs of a high-performance racing monohull, but with the privacy, accommodations and luxury of cruising cat. Thanks to its daggerboards and retractable rudders, the 66 can also explore skinny-water haunts that would be otherwise inaccessible. If you’ve got the wherewithal and ambition for globe-girdling adventures, the Gunboat 66 is the perfect cruising yacht.